What is Round House like? 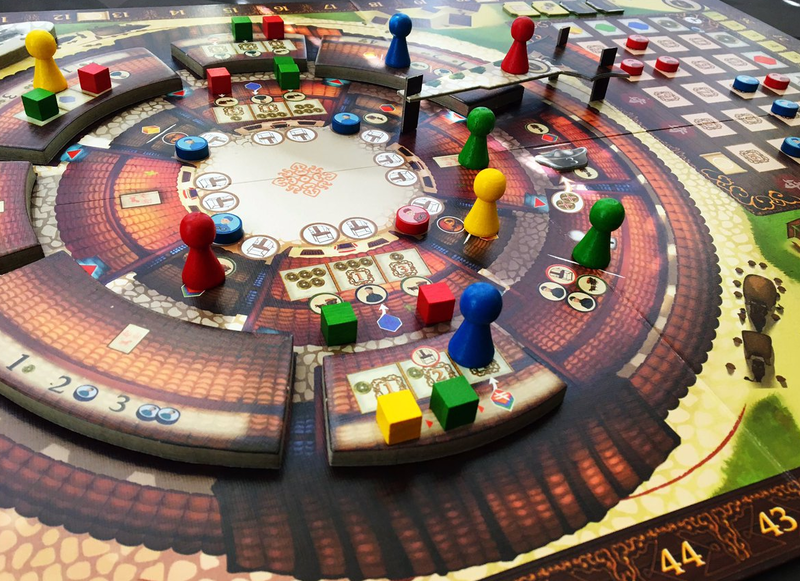 Round House, at its core is a worker placement game, but, the way you place to workers is a little different from the average worker placement game. Like most worker placement games, on your turn, you place a worker on a specific action which enables you to gain goods, trade goods, hire experts, send family members to other towns or worship your ancestors. 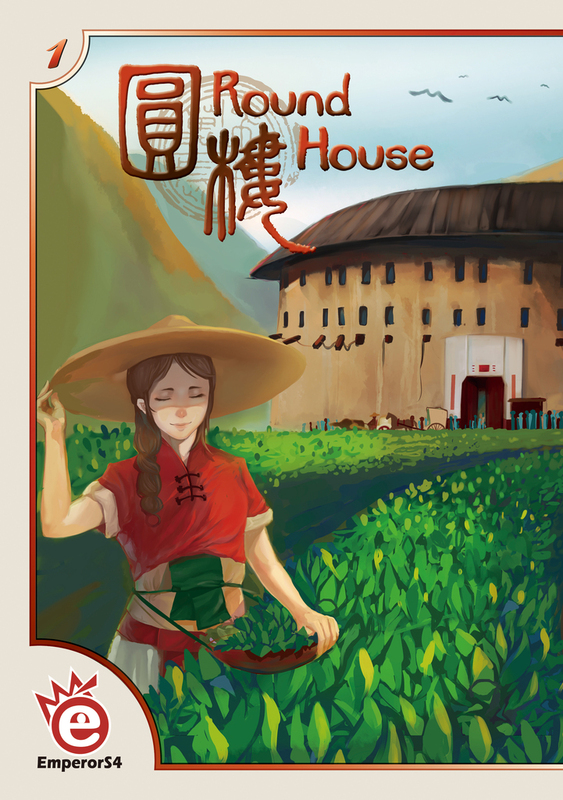 The difference in, Round House, is that you are moving your workers around the house moving from space to space with a limited amount of movement each turn. Each turn the players may play experts which give varying abilities. After they decide if they want to play an expert they must move one of their two family leaders clockwise between 1 and 3 spaces. There are two paths in which the leaders can move, the inner circle and outer circle. Leaders can use stairs to go between the two circles, but cannot end their movement in the same space as another leader. What I love is that players do not count spaces they pass in which other leaders are residing, which allows for more movement. This might allow a player to get to a space substantially further than the normal 1-3 spaces. If the player reaches the Ancestral Hall (the start and end space of the inner/ outer circle), they must immediately stop there. Once in a room, the player may activate the room’s action which may include main actions and assistant actions. Each player has up to 15 assistants at their disposal, but only 5 are given to them without using a specific room action. The inside rooms allow you to use those assistants giving you a different additional action and there is even a way to use those assistants to allow you to perform the main action an additional time or two, by placing assistants in chairs near the rooms. After performing all of the actions that your leader’s room allows, you can potentially gain amulets or order cards by passing certain spots on the score track as well as fulfilling any orders that you may have collected the requirements for on that turn. After a specific number of rounds the game ends and you add up all of the points accumulated through amulets, completed order cards, recruited assistants, assistants left on the board and coins/resources. The player with the most points wins. Round House, is without a doubt, a very unique and interesting game. The restricted movement, at first, seems like it would lead to easier decisions, but I found that not to be the case. Each turn many options lay before you as you determine what actions are best for you and your opponent. Analyzing what your opponent might do, could cause you to make a choice that isn’t optimal. Did you stop them from getting that action, or did you play into their plan? What I liked about the game the most, beyond the unique theme, is the variety of ways you could score points. Without going into too many details, when you worship at the temple you are presented with a great opportunity to use assistants that you sent to neighboring towns. Those assistants can now get you points, amulets, etc. However, while you were sending assistants away, your opponent could have been fulfilling orders getting them special abilities and points. Another opponent could be capitalizing on the experts to give them flexibility, so no matter what space you occupy they always have options. However, each of the rooms provide unique opportunities and actions that require a pretty steep learning curve and before I knew about the updated rulebook, I was stuck making guesses due to the poor translation. This isn’t my favorite game, by far, but it is a game worth checking out for the theme, and its unique take on worker placement. The rules are poorly translated in the original rulebook, but a 2nd printing has improved them. The game is pretty deep and it can take a while to fully understand all of the different actions available. Even after playing the game I felt like I wasn’t sure what would be the best strategy. Each of the rooms providing different actions and the different routes to victory create a pretty difficult game.